Since 2001, The FocusOn Group, Inc. business-to-business digital publications have been providing marketers with a unique cost-effective method to deliver information. As the internet has surpassed print as the primary information resource for products and services, FocusOn publications reaches the targeted audience faster, with more information and at significantly less cost than through traditional advertising means. With Four monthly publications (Click Here to check them out), FocusOn is an industry innovator, allowing it's 100% full opt-in subscribers to stay up to date with the latest industry trends. Because the industries are ever changing, FocusOn now has also 4 twice a week (Tuesday and Thursday) Industry Insiders News services (Click Here to check out the latest issue). These insiders, like our monthly publications, are delivered right to the inbox of all of our opt-in subscribers. To find out on how we can help your business succeed, contact us directly by calling us at 888.538.5833 or emailing us at inquiries@thefocusongroup.com. Since we started in 2001 the internet has evolved into much more than just a host of web sites as it became an excellent means to deliver more information to a targeted audience at significantly less cost than through traditional advertising means. With this evolution the first FocusOn digital publication was launched in 2001 targeted to aggregate producers across North America. The FocusOn Aggregates "E-Mag" was unique and did not include hard sell advertisements pushing products or services. Instead, professional writers worked in conjunction with the suppliers to the aggregate industry to provide a collection of detailed reviews that would provide the reader with concise features and benefits of the product or service. The format was a success. FocusOn Aggregates circulation numbers rapidly grew and eventually more than 20,000 aggregate producers had signed up to receive the publication by email. Expansion was inevitable and in 2005 a new company, The FocusOn Group Inc. was formed. 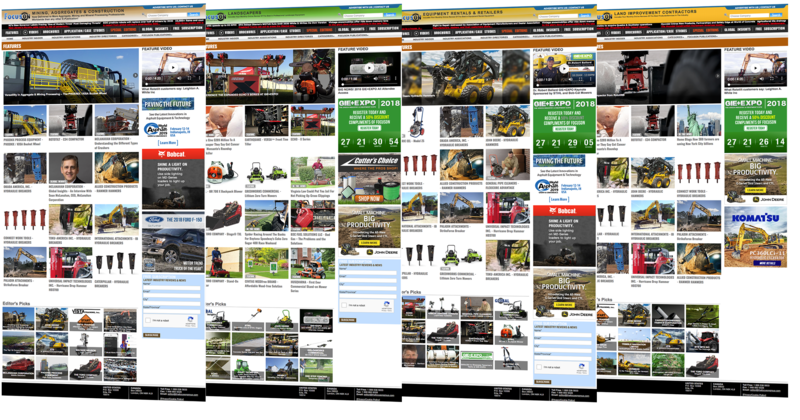 The mandate of the new company was clear: Build on the successes of FocusOn Aggregates and ensure that continuous enhancements are made to the publications to meet changing online technology. With new technology and constant changes in how digital material is found, treated and viewed online, The Focus On Group has ongoing investments to ensure their publications are comprised of the most current cutting edge features. Many marketers that use FocusOn digital publications have been doing so for years. Some FocusOn clients first turned to the e-publications as an alternative method to reach their key markets when their advertising budgets were reduced. They quickly realized that the FocusOn method enabled them to retain and actually increase their exposure to their customer base at far less than they would have to spend on other forms of media. This has led to FocusOn publications to be the choice media during both good times and challenging times for many marketers. The company is currently considering other markets for new FocusOn digital publications and is expanding the number of internet based services available to marketers. ... and there is much more, so please take a tour of the features and benefits of the FocusOn digital publications located in the individual publication section of this site. FocusOn Mining, Aggregates & Construction is delivered monthly to aggregate, road and bridge building professionals throughout North America as well as several thousand world-wide. FocusOn Landscapers, is the digital monthly publication exclusively created for Green Industry Professionals. FocusOn Equipment Rentals focuses on profiling in detail products and services for the Equipment Rental industry, and is delivered monthly by email to owners and operators of rental stores across North America. Industry Insider is a news service delivered twice a week (Tuesday and Thursday) to our opt-in subscribers. 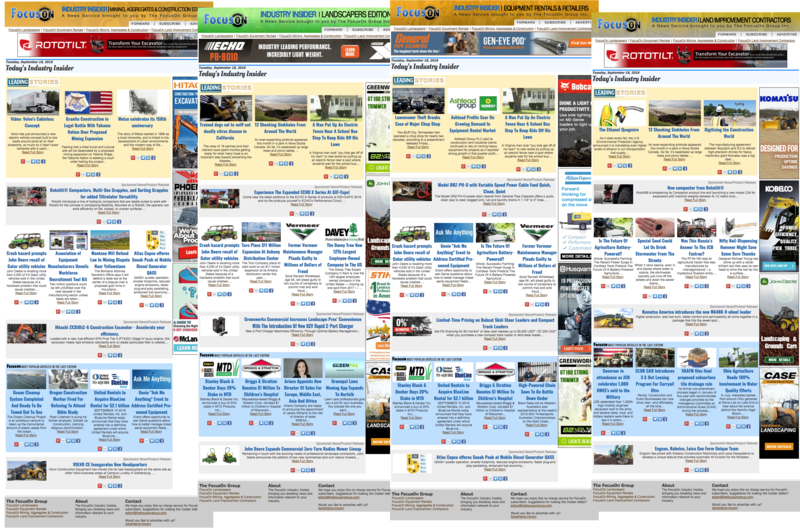 We feature the latest industry news for your marked delivered directly to your inbox. These EBlasts/Exclusive Corporate Editions are delivered to the full subscriber base of one or more of our publications. This is a custom e-mail created specifically for you by FocusOn, or by you or in conjunction with you. This email is exclusive to your material and is sent independently of the regular monthly publication, at the exact day and even the exact time you specify.